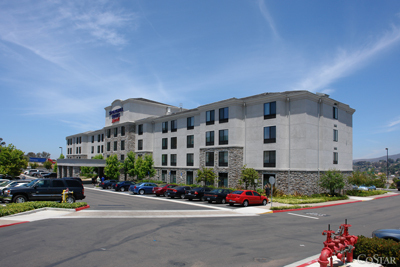 American Realty Capital Hospitality Trust, a non-traded real estate investment trust, will buy the 145-room Courtyard by Marriott on Owens Avenue in Carlsbad, the 137-room Springhill Suites by Marriott and the 95-room Residence Inn by Marriott, both on Scripps Highland Drive in Scripps Ranch. When the purchase of the Equity Inns Inc. portfolio is complete this year, American Realty Capital will own 132 hotels containing more than 16,000 rooms across the country. Assuming the portfolio deal is realized, it would become "one of the largest owners of select-service hotels [by enterprise value] in the North American lodging REIT sector," ARC Hospitality said. ARC Hospitality on March 27 completed its first portfolio acquisition, worth a combined $106.5 million, with interests in six hotels across five states, totaling 1,181 rooms. A unit of New York-based Goldman Sachs Group Inc. (NYSE: GS) acquired Equity Inns Inc. for a deal value of $1.29 billion in 2007. At that time, the target's assets entailed 132 hotels and 15,731 rooms. The privatization of Equity Inns was completed in October 2007. ARC Hospitality anticipates funding about $271 million of the purchase price with cash on hand, about $976 million through assuming existing mezzanine and mortgage debt and roughly $227 million through additional mortgage and mezzanine financing. ARC Hospitality recorded a 66.9 percent occupancy at the end of the first quarter for its existing six-hotel portfolio of 1,181 rooms.